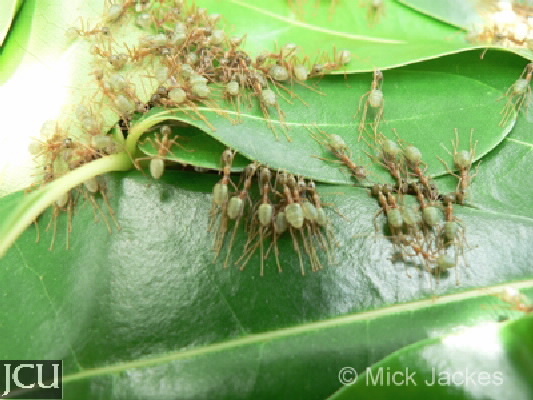 This is one of weaver ants, where the workers pull the leaves together and seal them using the silk produced by the larvae. Nests will be found all over the campus, the ants will bite when disturbed as they defend their nests. The abdomen may be eaten as bush tucker, taste is not unpleasant, a bit like lime, the larvae may also be eaten or squashed in water to make a refreshing drink. The greenish abdomen has several horizontal ridges on it.